Polyplumb is the integrated flexible plumbing system from Polypipe, incorporating polybutylene pipe and a complementary range of push-fit fittings. It can be used in domestic hot and cold water supply, and radiator and floor heating installations. The system offers a high degree of reliability, achieved through a product design that has been tried and tested over the past 30 years. Polyplumb 10mm pipe insert / stiffener / liner PB6410. Polyplumb 15mm pipe insert / stiffener / liner PB6415. Polyplumb 22mm pipe insert / stiffener / liner PB6422. Polyplumb 28mm pipe insert / stiffener / liner PB6428. 10mm Polyplumb polybutylene barrier pipe, sold by the metre (max 50m). Polyplumb polybutylene barrier pipe 10mm x 50 metre PB5010B. 1 foot length 15mm Polyplumb polybutylene barrier pipe. 25 metre coil 15mm Polyplumb polybutylene barrier pipe PB2515B. 1 foot length 22mm Polyplumb polybutylene barrier pipe. 25 metre coil 22mm Polyplumb polybutylene barrier pipe PB2522B. Polyplumb 10mm coupler / connector PB010, push-fit plastic plumbing fitting by Polypipe. Use Polyplumb with Polypipe grey polybutylene pipe, or you can combine Polyplumb fittings and copper pipe. Polyplumb 15mm connector PB015, push-fit plastic plumbing fitting by Polypipe. 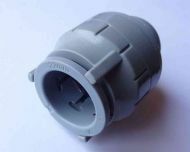 Polyplumb 22mm coupler / connector PB022, push-fit plastic plumbing fitting by Polypipe. Polyplumb push-fit 28mm coupler / connector PB028, push-fit plastic plumbing fitting by Polypipe. Polyplumb 10mm elbow PB110, push-fit plastic plumbing fitting by Polypipe. Polyplumb 15mm elbow - PB115, push-fit plastic plumbing fitting by Polypipe. 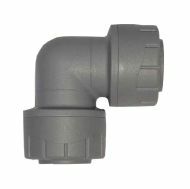 Polyplumb 22mm elbow - PB122, push-fit plastic plumbing fitting by Polypipe. Polyplumb push fit 28mm elbow PB128, push-fit plastic plumbing fitting by Polypipe. Polyplumb PB1715 15mm x 1/2 inch BSP elbow tap connector. Polyplumb 22mm x 15mm x 15mm reducing tee PB1522 (15mm on the branch), push-fit plastic plumbing fitting by Polypipe. Polyplumb 22mm x 15mm x 22mm reducing tee PB1422 (22mm on the branch), push-fit plastic plumbing fitting by Polypipe. Polyplumb 22mm x 22mm x 15mm reducing tee PB1122 (15mm on the branch), push-fit plastic plumbing fitting by Polypipe. 15mm Polyplumb blank cap PB6915, push-fit plastic plumbing fitting by Polypipe. 22mm Polyplumb blank cap PB6922, push-fit plastic plumbing fitting by Polypipe. Polyplumb fitting reducer 15mm x 10mm PB1815, fits into a 15mm fitting to let it accept smaller 10mm pipe. Polyplumb 22mm x 15mm socket reducer PB1822, pushes into a 22mm fitting to reduce it to 15mm. Polyplumb fitting reducer 28mm x 22mm PB1828, one end goes into a 28mm fitting, the other accepts 22mm pipe. Polyplumb 15mm x 1/2 inch BSP tap connector PB715. Polyplumb 22mm x 3/4 inch BSP tap connector PB722. Polyplumb 10mm equal tee PB210, push-fit plastic plumbing fitting by Polypipe. Polyplumb 15mm equal tee PB215, push-fit plastic plumbing fitting by Polypipe. Polyplumb 22mm equal tee PB222, push-fit plastic plumbing fitting by Polypipe. Polyplumb 28mm equal tee PB228, push-fit plastic plumbing fitting by Polypipe. Polyplumb push-fit 15mm isolating valve.